Nature of the walk : Well-marked and signed paths in woodland and pasture which can be muddy at this time of year, so do come prepared. PARK A lay-by beside the telephone kiosk in the tiny community of Chapelburn, 2km/1¼ miles east of Low Row, accessed off the A69, some 41/2 miles east of Brampton in north Cumbria. Three years of Park and Striding and only now am I bringing listeners onto the doorstep of a particular passion of mine, Hadrian’s Wall. Mind you with daylight hours at a premium and conditions underfoot continuing the soggy pattern of the year past, I am keeping well away from sensitive archaeology, at least in the context of the main prescribed walk. The walk pays undivided attention to a secret gorge of the Irthing, snaking through resilient carboniferous rocks. The Comb Crag gorge is quite a well-kept secret, little visited though the paths are easy to follow and well served with path furniture and signs all securely maintained by the East Cumbria Countryside Project. In fact as the walk is so short, proving that size and length is not everything, many walkers will be interested to explore a little more in the area, hence I am recommending a visit to Willowford Roman bridge close to Gilsland, right on the border with Northumberland. Once across turn left and go through the field-gate in the meadow-partitioning fence. Keep company with the river along the meadow’s edge with a high wooded bank on the far side. 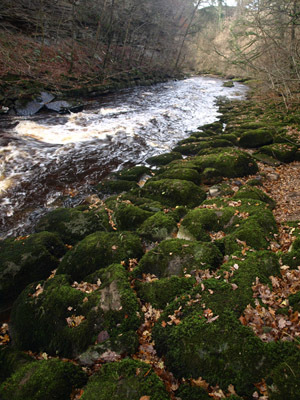 The river swings right creating a large stony shore, which is really worth beachcombing, the variety of pebbles is amazing, I spotted a water worn Kirkhouse brick and what appeared to be the remains of a geologically ancient giant fern stone. 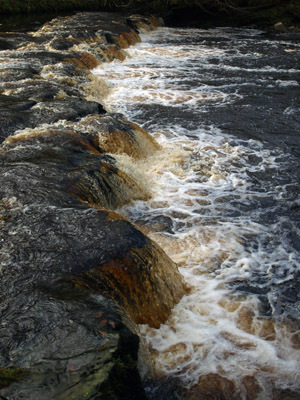 The river-name describes the rich dark earthy tone, it is a healthy river for all that, caused by the intensity of peat carried in suspension, the river-source being the massive peaty wastes of Paddaburn and Butterburn Flow amongst the dense conifers of Spadeadam. At this point I encountered the farmer from Lanerton, David Hall. A cheery guy willingly sharing a view on his world as shepherd, stockman and all round farming handyman for his 350-acre farm. 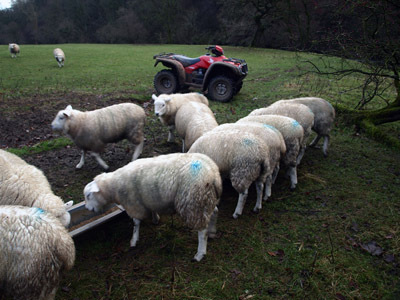 I commented on the damp season and he affirmed that his continental crossbred sheep had suffered with this year’s lambs yet to fatten sufficient for market. Over the twenty years he has been at the farm his stocking has had to double and when he came there were three men working on the holding. The river tumbles over a three-foot step in the riverbed providing the first excitement as the gorge is entered. The footpath crosses a fence stile and strides along a concrete platform, fit for a harbour landing-stage. The path steps off and runs below the old Leap Quarry cliff, spot the bird-box set into the rocks. Rising over a bluff it descends and crosses single arch-bridge over Wall Burn, one wonders why such a beautiful little bridge was constructed here it looks Victorian. 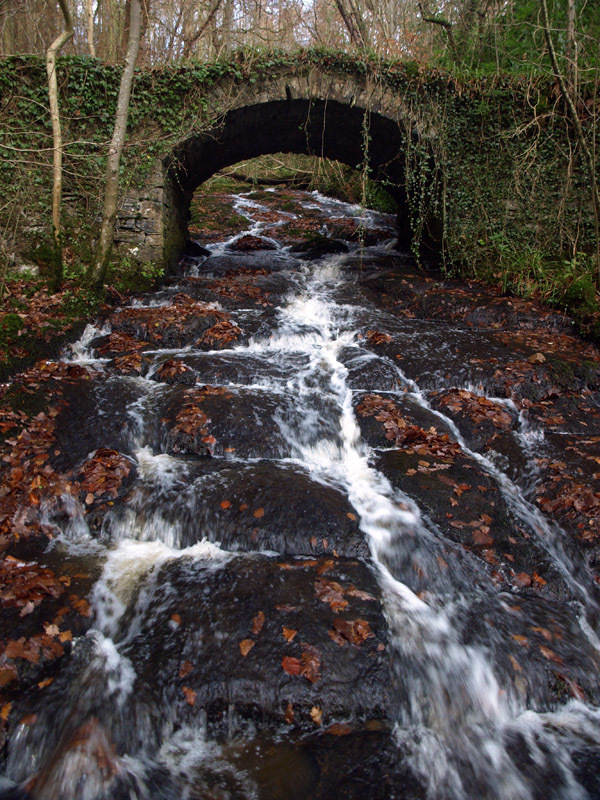 The burn cascades down a solid rock bed. The name Wall Burn gives a clue to another nearby historic feature. 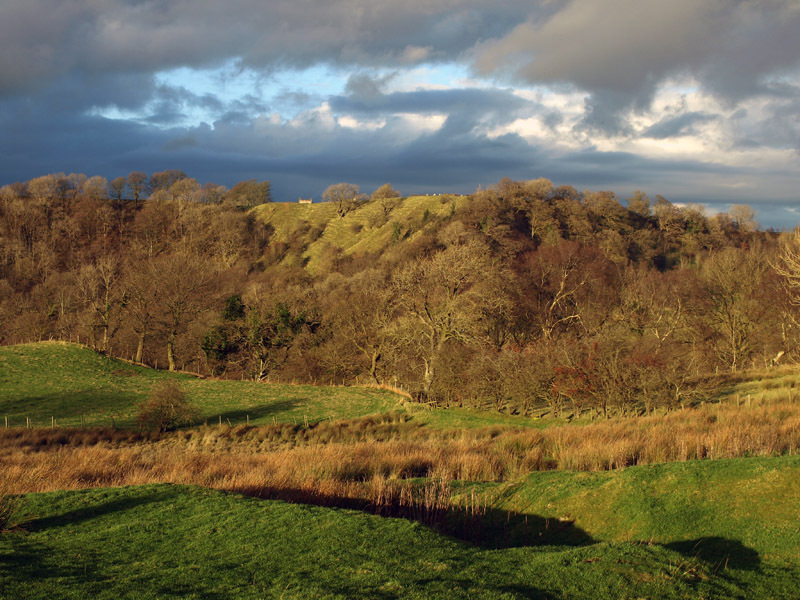 Higher up the stream slices through Hadrian’s Wall in the vicinity of turrets 50B. The plural because there has indeed been two, one on the turf Wall and one on the stone Wall, almost a unique moment as the two frontier features ran on separate courses at that point. 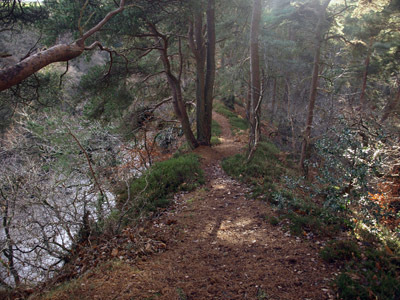 Hereon the gorge path advances to turn sharp right and climb easily up the woodland bank beneath a large broken cliff of sandstone, by and large this is a Roman freestone quarry. Low down on the east side Roman soldiers made an inscription, including the names Securus, Iustus, Maternus and, no longer visible, Daminius, who added "I did not want to do it". An inscription at the foot of the cliff to a supposed 'Faust et Ruf Cos' referring to consuls of 210 AD is a forgery. Coming up to a rock-cutting there is a three-way footpath sign. The cutting has been afflicted by names and letters always interesting to observe, the oldest I spotted was a ‘Wood-Warden 1850’, though somewhere in this vicinity there is said to be Roman graffiti too. The most eye-catching is the Ordnance Survey benchmark on the left-hand side an arrow pointing to a precise indent spot on the corner. One may follow the footpath right leading to Comb Crag farm and the minor road meeting up with Hadrian’s Wall National Trail. But at this time of year and in this very wet year in particular it is as well to give it a break. Actually the most exciting route is left down the narrow ridge adorned with heather and scots pine. A broad path leads almost back to river level, bearing right at the bottom to reach another three-way footpath sign. Continue forward singed ‘Wallholme’. This leads through a wicket-gate in a wall and on through an area of open woodland supplemented with young plantings. The path is not shown on current maps for all it is well defined and formally waymarked. A muddy gill crossing equipped with stepping stones, though there are spots that are nonetheless, muddy still. Passing through a hand-gate the path runs on with a fence close left and after fences funnel cross a fence-stile and continue through the light woodland, with more young tree planting sheathes to emerge at a stile and galvanized field-gate (sad to observe that its predecessor has been discarded on-site, quite bizarre). The path forks opt for the path veering left down beside the fence and adjacent to the stone flood bank (see below), quite an old feature one would guess protecting the meadow. Ignore the two fence stiles onto the riverbank they are for fishermen. Coming onto a track and into a lane arrive at a gate beside Wallholme Bridge and Farm. A place of livestock from puppies to black geese and ducks. Turn left over the bridge, gazing up and downstream, and follow on with the road which rises by the handsome house called Nook set back in a cobbled yard. A couple of retired caravans and another cottage lead to a road-gate, where a green track veers invitingly right. Go through the gate and continue with the open road to with St Cuthbert’s church a striking feature ahead. 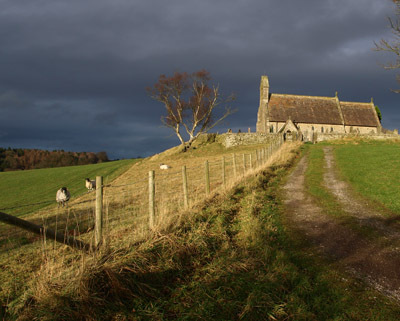 The road passes through a gate and becomes a lane, the view of the church showing that it stands on a definite platform. In fact the churchyard rests upon a Stanegate fort, much older than Hadrian’s Wall. I suggest you follow my lead and walk into the churchyard, the memorial stones providing a valuable record of the local family names. To the left of the porch see a broken Roman altar (see below), a marvellous contemporary artifact from long decades before the Hadrianic frontier was even conceived. 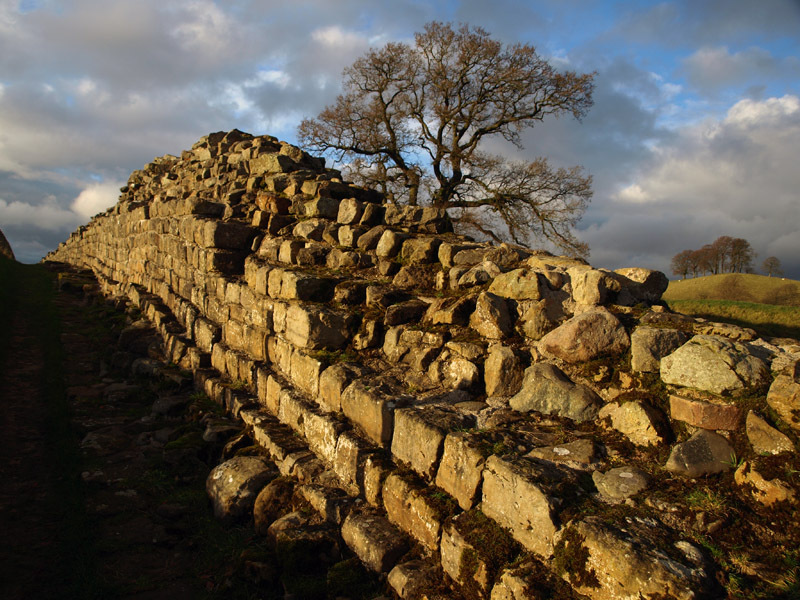 Follow the road through to the public highway, which plays its part in the Roman story as it follows the precise course of Stanegate. Turn left to complete the walk. If you’ve made the effort to come this far and you have a bit more exploratory time to spare, then I can recommend you visit these two local curiosities with the minimum of extra walking, just a spot of modest driving. Upper Denton lies one mile east of Chapelburn, the tiny community isolated by the Carlisle/Newcastle Railway, so you have to step over the (monitored) gated-level crossing. 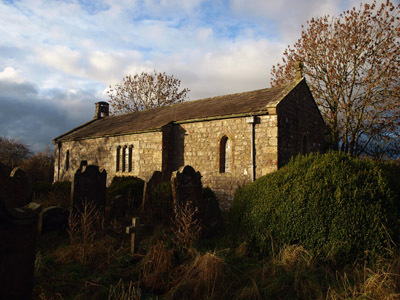 At the far end of the ‘street’ find the overgrown churchyard with privet bushes and tussocks tangling with the stone memorials and a locked little church built, so it is claimed from borrowed Roman masonry, the lead guttering has castellated heads dated 1881 and hidden within late-Saxon features. 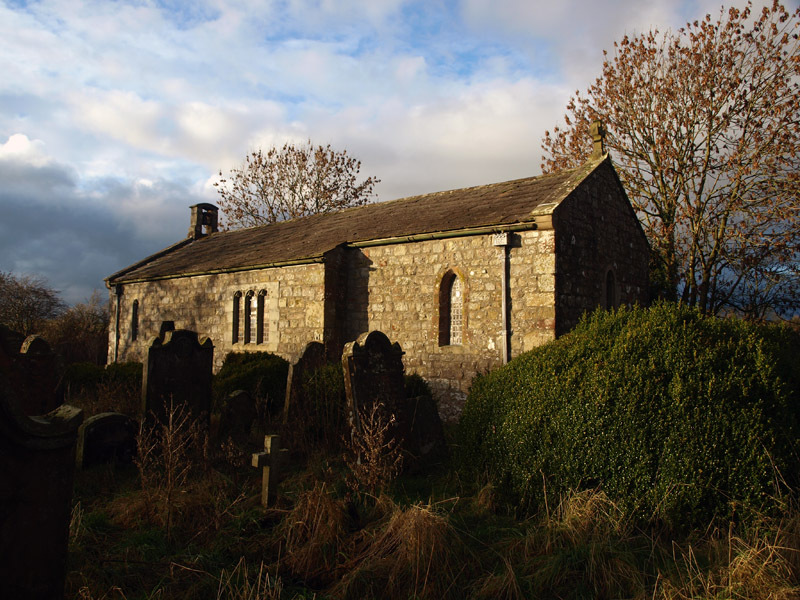 To the east of the rank churchyard hedge see a ruined barn, considered to have been a vicar’s pele, a defended house from the awful age of Border Reiving; comparable with the tower in Corbridge churchyard wall and Linstock Pele, the original home of the Bishop of Carlisle. 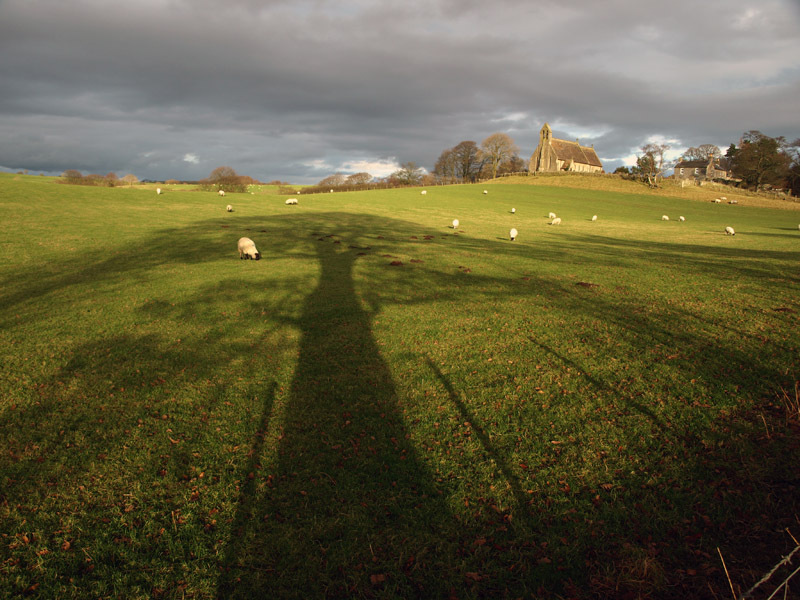 In the pasture just beyond lies a Roman earthwork and a prime view of the Birdoswald fort scarp above the Irthing - one can just see the mock-crenellation of the mid-Victorian farmhouse conversion. 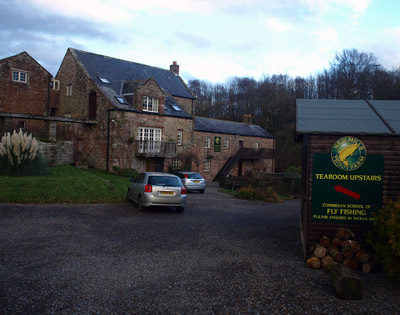 Drive on a further mile to Gilsland, parking in the formal car park beside the primary school at the point of entry into the village. From here a half-an-hour there-and-back stroll can be undertaken. Follow the farm-track opposite, guided by Hadrian’s Wall National Trail signs and most obviously a length of restored Wall which includes a turret. Notice the broad-wall wings, showing that it was built right at the beginning of the Wall building stage and before the curtain Wall itself. The track then switches right, through the Wall to pursue the base of the Wall ditch, a monster feature at this point. 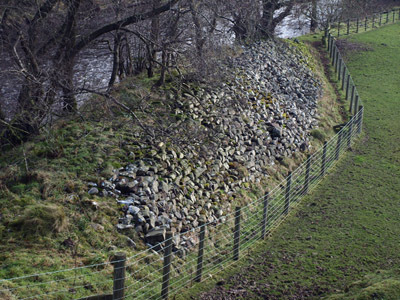 The footpath, however, stays on the south side of the Wall, here an amazing piece of reconstruction, fenced from the field. At the end go through a hand-gate and onto the farm-track passing the entrance to Willowford farmyard (a popular over-night for Trail walkers). Steps lead on down to the Roman bridge abutment, with information panels to give some indication of the phases of construction. The trail itself continues and could be followed over the Millennium footbridge spanning the Irthing, up Harrow Scar and on to Birdoswald (Banna) Roman Fort, a there-and-back that far would take a full hour, but would be time very well spent. Sadly this English Heritage visitor centre/café is only open from late March to the end of October. 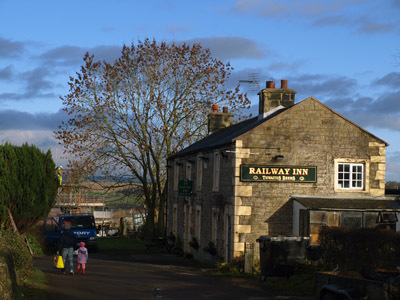 The Railway Inn in Low Row and New Mills tea-room just off the A69 half-a-mile east of Brampton, coincidentally the proprietor lives in Chapelburn.